On the other hand, sugar is added to many foods, especially processed foods, to make them taste better. It is hidden in foods that you wouldn’t even think would contain sugar such as, salad dressing. It is also added to fat-free foods to make them taste better. 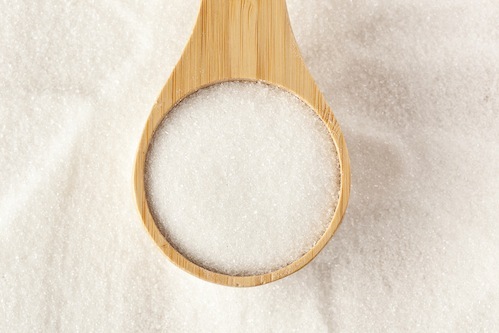 Added sugars are the ones that we want to remove mostly, if not completely, from our diets. 1. When grocery shopping, read the ingredients and nutrition facts of your foods. Since sugar is added to so many foods, you can’t tell which foods are going to contain sugar just by looking at them. You actually need to read the nutrition label and the ingredient list. Some other more common ingredient names that mean sugar are barley malt, beet sugar, brown sugar, cane sugar, caramel, corn syrup, corn syrup solids, dextrose, fructose, fruit juice, glucose, high fructose corn syrup, honey, maltodextrin, maltose, malt syrup, rice syrup, sucrose, etc. 2. Buy fresh fruits instead of canned fruits. Often, canned fruits are packed in sugary syrups. You may buy the canned fruit thinking that it is a healthy choice because it is fruit. But, if it is packed in heavy syrup, it contains extra added sugars, not to mention, extra calories. If you still want to buy canned fruit, choose the ones that are packed in water, juice, or light syrup. 3. Try to reduce the sugar that you use when you are making food at home. You can do this by looking for recipes that use sugar substitutions. While artificial sweeteners have their own negatives, sometimes, especially if you have a health condition that requires you to cut down on sugar, it can be beneficial to use them instead. Although it is best to avoid making the foods all together, you can search for recipes online that are low in sugar or that use other ingredients, besides sugar, as a sweetener. 4. Try to cut down on the sugar that you add to your food. Do you really need to add 3 packets of sugar to your coffee? And, do you need to put sugar in your cereal? Try at least decreasing, if not completely eliminating, the amount that you add to your food. Eventually you will get used to the taste of food without the sugar, and you will find that you don’t need it. You may even find that you enjoy the food more. 5. Choose to eat foods that are naturally sweet instead. Fruit has natural sugars in it, and makes a great dessert or snack. If you feel that you are craving something sweet, eat a piece of fruit, and wait 15 minutes to see if your craving goes away. 6. Cut down on the amount of sugary beverages you drink. Beverages containing sugar is a major source of the added sugars that are consumed. Sugar is found in many beverages such as soda, fruit juice, some alcoholic beverages, iced tea, etc. An article from The American Journal of Clinical Nutrition found that weight gain and obesity is associated with increased consumption of sugar-sweetened beverages. Water and milk are much better options. 7. Don’t buy foods that contain sugar. There are certain foods that are mainly sugar, and are terrible for you. Candies, such as gummy candy, hard candy, suckers, and caramels, are mainly sugar. If this is something that you eat regularly, you may just want to avoid buying it as it doesn’t provide any nutritional value to your diet. Alex Chris is the chief editor of Calorie Secrets, a fitness blog providing weight loss tips and advice for a healthier lifestyle. Alex has been writing about nutrition and fitness for more than 6 years and he is constantly in search for a healthier and happier life. Murphy, S., & Johnson, R. (2003). The scientific basis of recent us guidance on sugars intake. American Journal of Clinical Nutrition, 78(4), 827S-833S. Malik, V., Schulze, M., & Hu, F. (2006). Intake of sugar-sweetened beverages and weight gain: a systematic review. American Journal of Clinical Nutrition,84(2), 274-288. Brown, J. (2005). Nutrition now. (4 ed., pp. 12-3-12-6). Belmont: Thomson Wadsworth. Wardlaw, G., & Hampl, J. (2007). Perspectives in nutrition. (7 ed., pp. 169-171). McGraw-Hill.